Theme parks are very popular kids' attractions in South Africa because of the various kinds of activities theme parks offer. Is a theme park for your kid(s) and your family? As well as being a fun family activity, many theme parks actually have an educational or informative element. Some parks are based around physical activity, such as water parks, and these can provide a great opportunity for the whole family to get some exercise and fresh air. The main benefit for kids visiting theme parks is fun and entertainment. Most of them have a number of rides suited to different ages, and some may even offer additional games and activities for kids. Most theme play parks have a selection of rides that are suitable for very young toddlers and children (although they may not be suitable for babies) with more thrilling rides aimed at older children and adults. Adventure type theme parks are best suited to bolder children who are not easily frightened, while more sensitive children might prefer a quieter setting or a more nature based theme. Get ready to get there with your kids! Most major cities have at least one theme park, but the Gold Reef City in Johannesburg is known for gathering the highest density in the country. 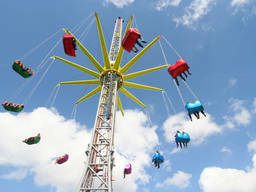 Admission to larger theme parks can be expensive but discounts may be available for families or season ticket holders. Getting there out of season could be an option if you want to pay less, but may not always be the best idea from a weather perspective. Often pre-booking tickets online can get you a discount of around 10%. They can get very busy during school holidays. It is best to arrive early to avoid long queues for rides. Weekends during term rather than school holidays may be better. Most theme parks in South Africa are open during the summer months, though some theme parks may be exceptions. It is advisable to check first if you are planning to go on a public holiday to avoid disappointment.